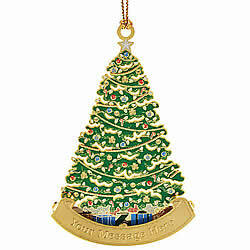 O' Christmas Tree Ornament [CA-ND-53171] - $22.50 : BaldwinBrassOrnamentStore.com, Ornaments and keepsakes that truly are works of art! This is a "Name Drop" piece. Customized with your personal message containing up to 24 characters (including spaces).